This week sees James in Earls Court for the first leg of a three week tour to release the new Range Rover ‘Evoque’. The launch will be one of the most adventurous ever seen with a huge amount of video, lighting and automation. 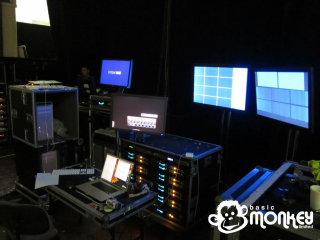 James is looking after the video aspects of the event for Tim Riley at XL Video, utilising 4x Catalyst media servers including two of Basic Monkey’s own and a huge rack of processing gear to drive the 20x Barco projectors. We can’t give away too much at this time but if you get the opportunity to see the show and the car, please do, you will be far from disappointed. Please stay tuned for more updates and photos after the run comes to an end.